Dr. Bob McGaughey, retired professor and chairman of the Department of Journalism and Mass Communications, was named one of 20 Volunteers of the Year (2015-16) at the national Pi Kappa Alpha convention Aug. 6 in New Orleans. 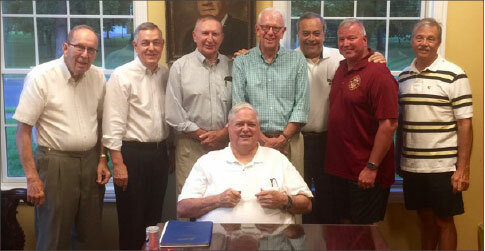 Seated is Dr. Bob McGaughey, Pike and Murray State alumni from left, Bobby Workman, Bobby Martin, Buford Anderson, George Oakley, Dan Miller, Jerry Penner and John Weatherly. Dr. Bob McGaughey, retired chairman and professor of the Department of Journalism and Mass Communications, was named one of 20 Volunteers of the Year (2015-16) at the national Pi Kappa Alpha convention Aug. 6 in New Orleans. Nominated by the MSU Pike chapter adviser and the Murray-Calloway County Hospital CEO, Jerry Penner, McGaughey was the only fraternity alumnus from Kentucky named to the list. McGaughey, a member of the “Fabulous Forty” pledge class of spring of 1962, has served on the alumni advisory board, on the house corporation and on the committee to raise funds and build the house on 16th street. The new house, built after the Pike Lodge north of campus burned in 2004, is named for the late Dr. Hal Houston. In addition, McGaughey has helped sponsor Rush activities and been a major donor for building the current Pike house. He also has spoken to the Epsilon Lambda chapter on its history, communications, public relations and the roles of officers. In 1977 he was named as second person to be the Pi Kappa Alpha Distinguished Alumnus. The first one was Dr. Houston. McGaughey joined the MSU faculty in 1969 as the adviser to The Murray State News and journalism instructor. He became department chairman in 1974. He retired in 1997 after 27 years and 23 as chairman. He then taught part time and worked with the BIS program in MSU’s Continuing Education unit until December 2010. McGaughey has received several awards/honors for his work at Murray State. He won the Max Carman Outstanding Teacher of the Year in 1984 and was named the Distinguished Professor by the Alumni Association in 1990. In 2015 he received the Golden Horseshoe Award for continued outstanding service and support of the university. Selected eight times to attend the International Radio and Television Society (IRTS) faculty-industry seminar in New York City, he was named the Frank Stanton Fellow as the distinguished broadcast educator in the U. S. by IRTS in 1987. His other honors include being named to “Personalities of the South,” “International Men of the Year,” “Who’s Who in America,” “Who’s Who in the South and Southwest,” “Who’s Who Among American Teachers,” “Who’s Who in the Media and Communications,” “Who’s Who Registry of Business Leaders” and “Men of Achievement.” In 2012 he was inducted into the Kentucky Journalism Hall of Fame. McGaughey may be best known for his presentations with his close friend, Bob Valentine. The two have done communications workshops/speeches and their comedy act of Dr. Trey and Dr. Vee since 1978.